KUALA LUMPUR (March 12): Finance Minister Lim Guan Eng has urged the public to evaluate the Malaysian capital market on a full-year basis before drawing any conclusion on its performance. "(In) 2018 we were better in terms of performance. You cannot just look at the snapshot, you have to look at the year's performance, the whole year of 2018 we were one of the better performing markets, but I don't know about daily ups and downs, we don't keep track. I think we have to look at whole year performance," he told reporters at the Parliament lobby today. 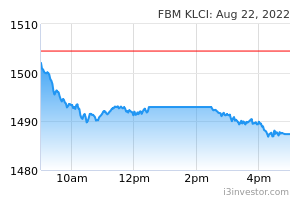 Lim was responding to an article by Bloomberg today, which reported that the FBM KLCI index was the only decliner in the region year-to-date, as investors are still waiting for government's initiatives — to cut the budget deficit, clamp down on corruption and boost purchasing power — to materialise. Earlier today, Moody's Investors Service analyst Anushka Shah released a periodic review report on Malaysia, stating that the country's credit profile is supported by the sovereign's "Very High (-)" economic strength, which reflects a large and diverse economy that is growing at a relatively strong pace and boasts high levels of competitiveness. Meanwhile, Anushka also said Malaysia's "High (+)" institutional strength reflects a credible monetary policy framework, but pervasive corruption and some constraints to government effectiveness. "Moody's assesses Malaysia's fiscal strength at 'Moderate', taking into consideration a high debt burden, weak debt affordability, and a narrow revenue base that is reliant on oil and non-tax revenues; balanced by a favourable structure, that is reliant predominantly on local-currency denominated funding," she said. "Malaysia's susceptibility to event risks is 'Moderate (-)', driven by external vulnerability risks on account of the economy's exposure to volatile capital flows and a high proportion of maturing external debt liabilities relative to foreign exchange reserves," she added.